Imagine holding a training where your volunteers and staff are enthused about the reading material! A training where the counseling and therapeutic communication skills are sinking in deeper and faster. The Trainees feel inspired to help others and are motivated to learn more about how to be more empathic and loving people in their day-to-day lives. All this resulting in the community receiving a better service. The Crisis Intervention Manual is specifically designed with the intention to Open people’s Hearts and Minds. 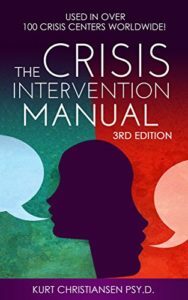 People love the Crisis Intervention Manual because it is an easy read and goes deeper into understanding ourselves and others, which keeps the material personally relevant throughout. Learn how to handle every type of call with empathy and confidence utilizing simple, yet effective models and methods. Learn why these problems occur and how to respond, using clearly explained examples that teach skills in action. Increase self-awareness through an abundance of self-directed exercises designed to expand consciousness of one’s feelings and judgments that can get in the way of being an effective helper. Build confidence in one’s self as a helper through combining all the above factors – creating authentic experiences for both listeners and callers. Try it out with a group of trainees and see the results first hand. Warning: Reading this Manual may result in raising individual and social consciousness, creating significant ripple effects throughout the world. The Crisis Intervention Manual is now being used in over 60 Crisis Lines across the country, including Contact Centers, The Samaritans, 2-1-1, AAS approved lines, and many others.